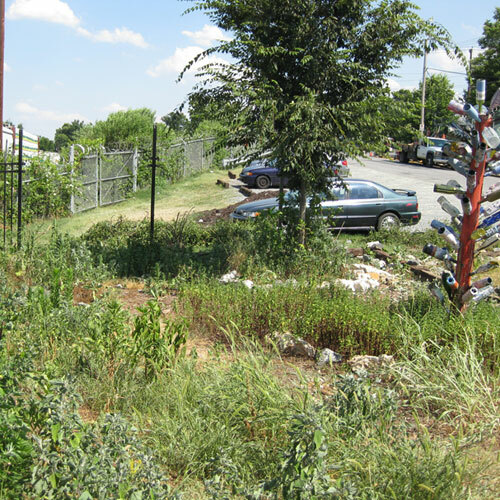 One of our main projects is creation of a labyrinth from painted urban rubble, on a weedy part of the property just made a bigger problem by moving a fence. 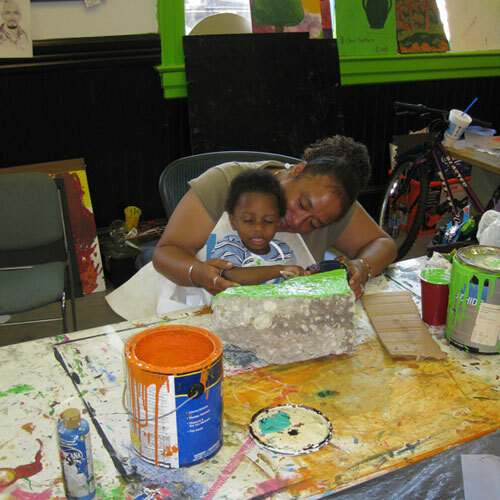 Painting rubble turns out to be a very popular activity, open to all, as you can see from this young artist at work. We continue to be a beehive of activity in the garden, stimulated by the generosity of Organic Gardening Magazine, Aveena, Nature’s Path and Seeds of Change. 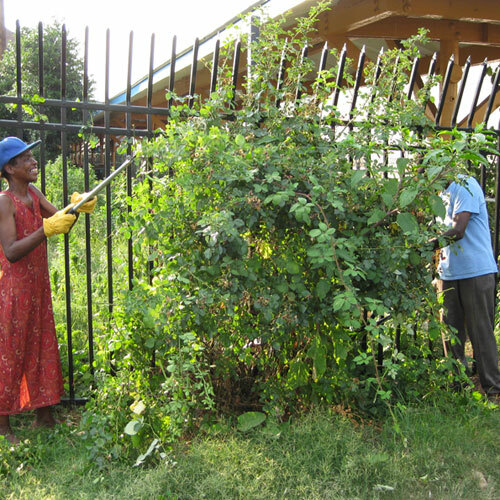 Their beautification grant, accompanying the grant for our new cistern, is helping us tackle some long-troublesome areas in very creative ways that involve everyone. 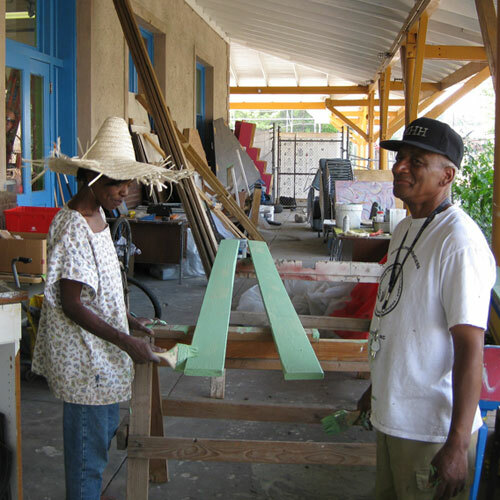 It’s what our Center is all about – the hope and engagement are, in their own way, as important as the food we serve. Of course, we need both. Some pics, and I close with a story. I need to get back over to the Center, rumor has it that the cistern is there! “Looks like a big, black silo.” Said Jason, our facilities director this morning by phone. Here are the results so far – we have about half of what we need. The rubble comes mostly from old sidewalks we tore up during construction of the new building, and from our old wall beside our first garden, so this is really part of our past. 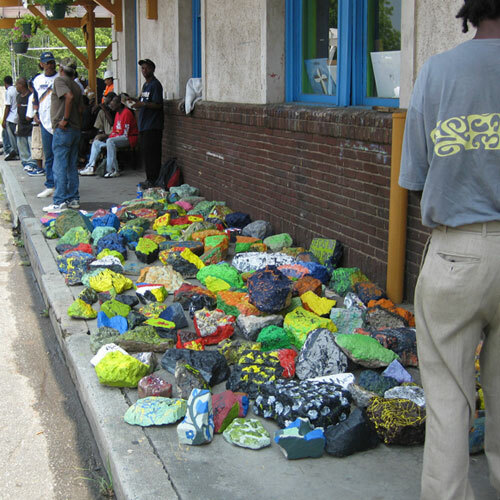 Street artist Lite Lewis inspired this rubble painting in our first garden, too. Meanwhile, the police department said we should move our fence, and so in the middle of everything else, that just happened. In the process, we’ve once again threatened our lovely New Dawn roses. They’ve been saved twice from similar fence projects, so we’ll do it again. We’ve only had to relocate one. Here’re Cleo and Joe cutting them back, and then a pic of the one rose’s new location. It is absolutely the worst time of year for such a move, but let’s hope (and water). This leaves us a clear view of where the labyrinth and expanded garden area will go – pretty challenging space to “beautify”, huh? If we can transform this space, who says that a person who is homeless can’t transform her or his life??? Meanwhile, other projects are going on. 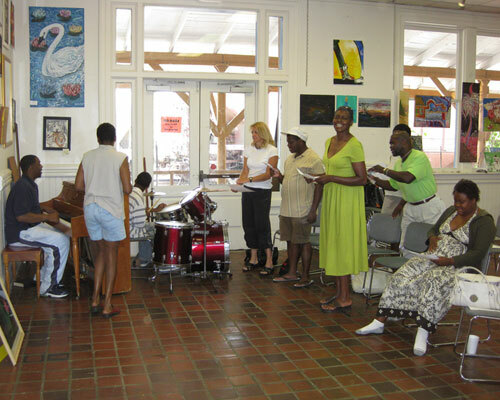 I’ve invited our gospel choir to sing at the big dedication event, July 10, 6 PM at the Center (mark the calendar). Here they are practicing. I have to get them words to ‘Wade in the water…’ and other aquamusical hymns. And here’s Cleo and Rollon (above) working on planters for the rest of our wave petunias (which need to get in by Friday). We’re building them from scrap lumber, using and paint from the good folks at Lowes (they aren’t donating, but their paint manager is great about mixing us colors and and helping as much as she can – at their University store). 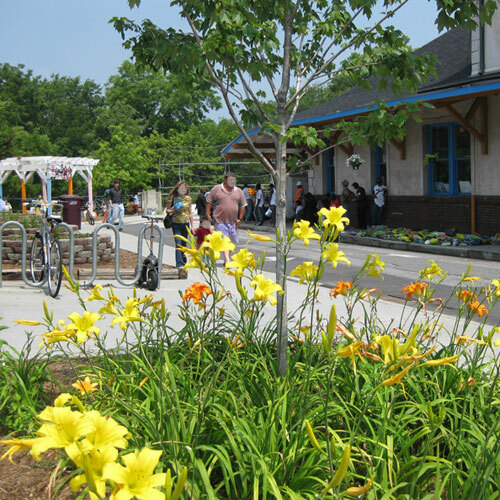 Get this – we have to put up a fence to block the public view of our cistern! If that isn’t the most bluenosed foolishness you’ve ever heard of! Our cistern is an example of doing exactly the right thing, saving rain from our heavy showers for those long dry spells, and using it to grow nutritious organic vegetables right in the city! But no, it doesn’t “look tidy”. Bucky Fuller famously said “We don’t have a resource problem – we have a design problem.” I’d say we have an aesthetics problem, too. Here’s Donald hard at work building the doggone fence. 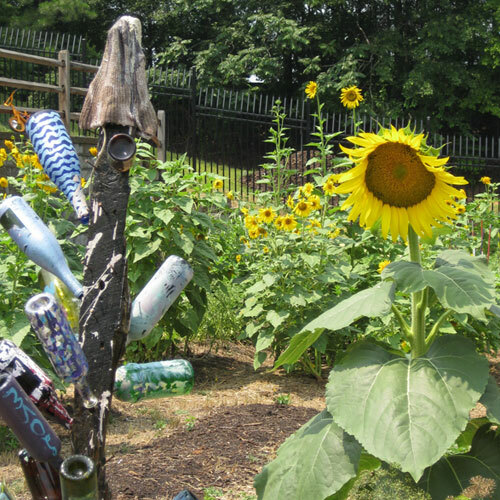 Out in the garden, the bottle tree and the sunflower discuss issues like these. I don’t know where the bottle tree got its doo rag, but that’s the fashion I guess. I prefer a straw hat, myself. At this point, I couldn’t keep still, and tapped on their car window. I listened as they explained their situation, and the feeling no one would help them. They said they’d talked to a counselor, so I asked them to stay for a minute while I did what I could. I rushed back over to the soup kitchen, forgetting my tour entirely I’m afraid. and raided the pantry. I threw together a box of fruit, peanut butter, bread, road food snacks, dumped it into a cardboard box, and ran back outside. But they were gone, the space in the parking lot empty. Even a couple of minutes was too long. You cannot think when you are hungry (I remember Knut Hamsen’s classic novel). Too late. I hope they are well and make it back to The City, and that those children survive to forget this long painful voyage, or remember it as an epic where they were the innocent heros on a difficult quest. Like Theseus and the labyrinth, I suppose. 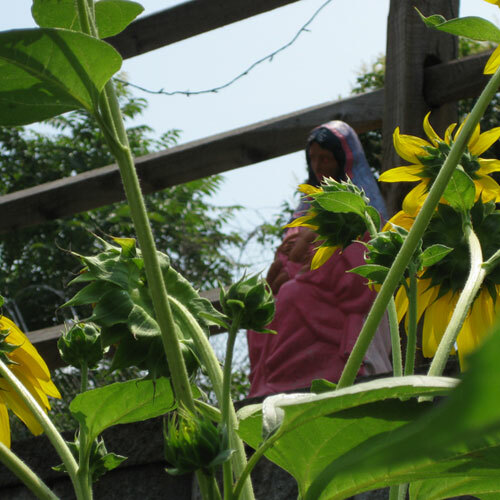 From above the garden, above the sunflowers, Maria watches, reminding us of improbable and painful stories that somehow, with grace, manage to end with compassion and hope.